while aiming 12 perc. bodyfat until dec18 i am cutting 3 days in the row psmf like and eat 4 days my maintainance calories on those days i train. while this is structurally a better option to urs rapid fatloss program, i do this without refeeds and dietbreaks. so the structure is pretty awesome as u can see from mond to fri (enough calories) because many coaches and scientists shedule minicuts in 3 day rows followed by refeed like tom venuto etc. i train at homegym with myoreps. on cutting days i do IF with bulletproofcoffee and c8 mct oil to not suffer from hunger too much. but i actually think RFL system is good too, i only adjusted it because i want to cut for a longer timeframe (!!!) without having breaks and suffering from hunger (!!!! ), mental and energyproblems, t3 fall, hormonal imbalances like testosteron plump , etc. pp. and supplementing with potassium,mg,calcium,omega3,glafattyacids,7ketodha , astaxanthin and a multivitamin. my fatintake is low in pufa but high in dha epa, a little bit coconut and egg fat. on mentaince day i try to consume more oliveoil for mufa, eat more potatoes for higher potassium, fruits despite its not functioning well (fructose bashing ), meat , milkproducts , other veggis i do not consume on cutting days , so on a weekly time frame i get all micros. as i am getting caloriedefict 7000 per week, i think i lose pretty much fat since dec. now im at 27 perc bf, so i can lose 30 pounds until dec. and get in shape. 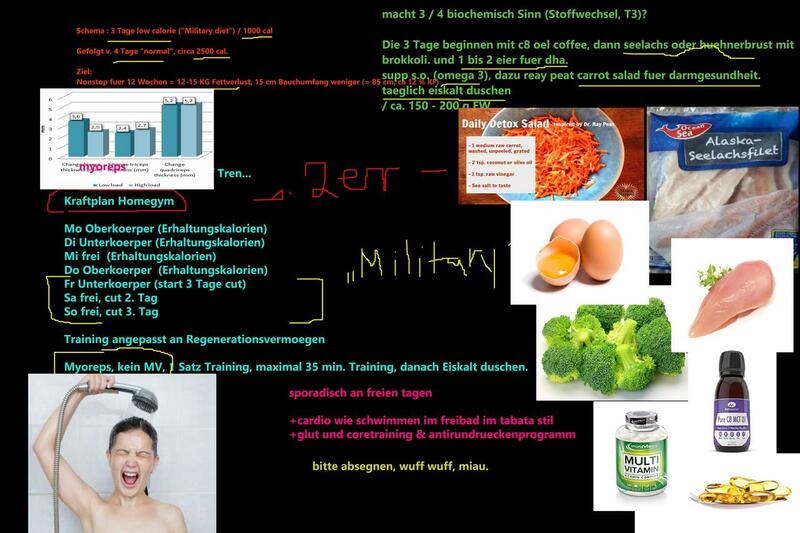 what do u think about my diet and training routine, are the described advantage to rfl obvicious or not? And how can i put it in practise, while im training in homegym now and have no machines etc. as i have scoliosis i have to take care on ma back, lifting squats and deadlifts for example, so i think i have to adjust. Sorry guys, you see this pictures, the greenblue writing - from friday to sunday cut (lets say only 1000 cal , therefore 6000 cal deficit) and from mo to thu mantanaince to raise leptin. As Lyle said in one article, it would be wise to chose the similar refeedtime frame for rising leptin as for falling... the halflife in your blood, in your cells of leptin is short, as it is for other hormones too!! You can understand that point when you read leptin falls 50% when you begin dieting! But as i am overweight and as i have more bodyfat (leptin correlate with it) , i guess, i choose 4 cutting days and 3 mantainance! I would discuss this stuff, its not easy to talk about leptin or leptinresistance though. but i think you have to aim several refeeddays in a row. - see above, CR is poison for leptin, i guess IF could be OK (as modified alternate day fasting, but has other disadvantage). I will read about bodyopus diet too, just to get practice stuff. You have a good imaganation how it works then. PS: A chinese fruit is very potent in does heal leptinresitance , forgot the name. And wouldn't worry about doing hiit on 1000 calories. Or do the cut days Monday to Wednesday and the maintenance/lifting days Thursday through Sunday if you have weekends off from work/school because most people like to eat more on their days off, and days you are working it is easier to stay busy/not eat as much. This isn't really much like RFL. 4 days a week at maintenance, 4 day/week upper/lower, 2 additional days of HIIT. Meh. I don't like the structure and think it's too much work given the 3 aggressive dieting days. I think you'd be happier with one of the various IF and/or EoD refeed type setups out there. There's also UD2 if you're looking for a more extended stretch at maintenance or higher calories.